Amaravati, Oct 30 (IANS) The first batch of farmers from Amaravati, who gave their land for the upcoming capital of Andhra Pradesh, on Monday left for Singapore to learn about the best practices in entrepreneurship. Chief Minister N. Chandrababu Naidu flagged off the bus carrying first batch of 34 farmers to Hyderabad, from where they will catch the flight for Singapore. The state government is sending a total of 123 farmers to Singapore. They were selected from among the farmers who have given their land for the development of new state capital. The state government will bear expenditure for their accommodation and food while farmers are paying for their tickets. 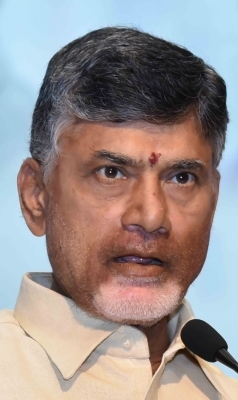 In his speech on the occasion, Naidu said he was happy to send farmers to Singapore and those who gave their lands for the capital should become entrepreneurs. The Chief Minister reiterated that Amaravati would be developed on the lines of Singapore. He exuded confidence that the new state capital would attract all top global firms. About 26,000 farmers have given 33,000 acres of land under a unique Land Pooling System (LPS), the largest exercise of this kind in the country. The Capital Region Development Authority (CRDA) has handed over developed residential and commercial plots to the farmers. Officials said the farmers visiting Singapore would learn how to use the land and the compensation to become successful entrepreneurs.